There was one explosion every three minutes at the burning artillery ammo depot in the Ichnia district of Chernihiv region on Wednesday morning, Ukrainian Defense Minister Stepan Poltorak said at a government meeting. "As of this morning, the intensity of detonations stood at one explosion every three minutes. There was a powerful explosion overnight," Poltorak said. "Aircraft of the State Emergency Service started fighting the fire in the morning. [...] There is still smoke inside the depot, but I believe we can deal with it in the near future," he said. The depot was storing 69,500 tonnes of munitions, including 43,000 tonnes ready for use, when the fire broke out, Poltorak said. "The depot has a capacity of 127,000 tonnes of munitions. It was storing 125,000 tonnes at the beginning of 2014. Since then, 56,000 tonnes of munitions have been moved to other bases and depots where we have the ability to store them safely. This is a load of about 1,500 train cars, 50 trains, considering our limited loading/unloading abilities," he said. 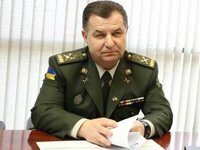 The depot also stored component parts and munitions which are not commissioned as weapons of the Ukrainian Armed Forces, Poltorak said. "For instance, there are Tulpan mines. We have no such weapons, and the munitions were prepared for scrapping," he said.